Levitt AMP concertgoers in Berea are in for a night of vibrant rhythms and dancing tonight with Kentucky’s own Appalatin! A perfect match against the rustic backdrop of the Old Artisan Village of Berea, Appalatin has been making waves in the South’s thriving folk fusion scene as well as across the United States, thanks to their unique confluence of pan-Latin genres and traditional Appalachian music––beautifully bridging the gap between these seemingly disparate styles. Made up of members from Kentucky, Australia, Ecuador, Mexico and Guatemala, Appalatin mirrors the rich heritage of North and South American music found all across the Southern United States. Their fleecy acoustic instrumentation, incorporating pan flutes, mandolins, charangos and guiros alike, emphasizes the lively, communal feeling of their music––extended solos, call-and-response vocals and breakdowns are all part and parcel of the Appalatin experience. Such practices are tried and tested in folk music culture, be it at the foothills of the Andes, or in the rolling hills of Louisville, Ky., the band’s home base. Equal parts dance party and folksy-freewheeling, Appalatin’s fresh take on evergreen tunes like “Guantanamera” and “Down By The Waterside” make for an irresistible musical experience. Since the release of their self-titled debut album in 2011, the band has brought their effervescent music to wider audiences, sharing the stage with similarly-minded, genre-bending artists––La Santa Cecilia, Ben Sollee, Red Baraat and more. In 2013, they even performed at the Louisville Yum! Center at a talk given by the Honorable Dalai Lama, sharing their music with a crowd of more than 10,000. Using music as a vehicle for cross-cultural understanding and social justice is paramount to Appalatin’s members. 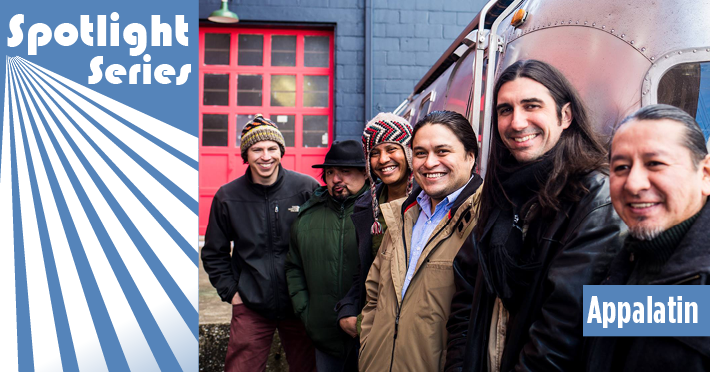 Through their unique ‘Assembly’ programming, the band offers interactive workshops at schools, festivals and other institutions, giving participants a deep-dive into Central American folk music roots, principles of songwriting, Andean instruments and more topics. Their flagship performance, ‘Cornbread and Tortillas’ features the band’s members and other artists from Kentucky, performing a narrative drama of international musicians, teaching each other the varied forms of their craft. Having brought this performance to schools and colleges around the Southern United States as well, it’s clear that Appalatin isn’t just about music––they are dedicated to bringing communities together through diverse music, in a holistic manner. Berea, close out your Levitt AMP Music Series with a bang, getting down to one of Kentucky’s most unique bands this Friday at 8:30PM! This entry was posted in Levitt AMP, Levitt Artists and tagged Appalatin, Berea, Levitt AMP on September 7, 2018 by Rounak Maiti.